Fish sauce has long been a staple of Southeast Asian cooking. Made from fermented fish with sea salt, it has a strong, distinct flavor that enhances all the delicious flavors in Asian cuisine. Easily recognizable as a truly Eastern condiment, it’s fascinating to learn it has ancient roots in Western Europe as well, specifically in ancient Rome. Food historian Sally Grainger, co-author of The Classical Cookbook, explains that fish sauce was used not only as an alternate way to salt food, it also became the base for other dips and sauces when it was combined with wine, honey and other spices. Today it is being used in much the same way as modern chefs experiment by adding various herbs and spices to create new, exciting flavors. It is difficult to find traditional garum today. The more commonly used Italian fish sauce is colatura, a modern descendant of the ancient garum. In his blog MattBites, Chef Matt Armendariz explains that “if garum is the loud in-your-face uncle, colatura is the mannered and finessed younger cousin.” It is made with anchovies and results in a more lightly colored and delicately flavored sauce. 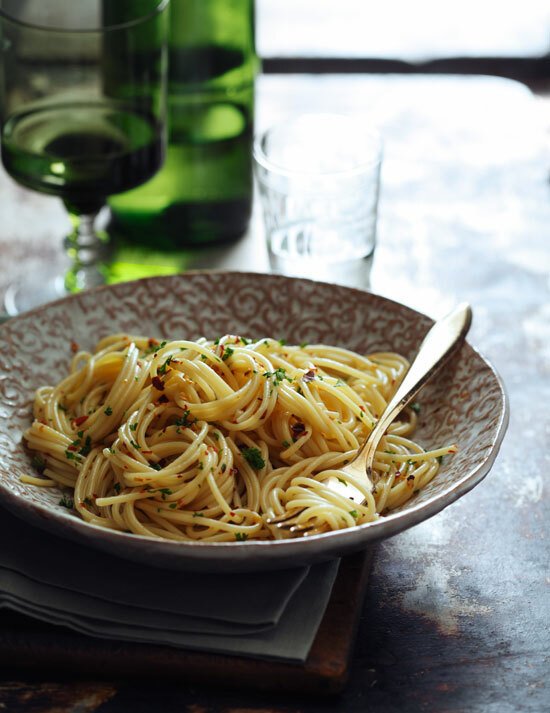 Chef Armendariz is the source of the delicious spaghetti recipe below, but first perhaps you’d like to try your hand at making your own authentic ancient fish sauce! We’ve included two recipes below: one that is authentically ancient and another that is updated and less challenging. When you’re finished making your sauce, follow the spaghetti recipe below for a truly Roman dish. Of course, you can always buy some colatura and skip straight to the spaghetti! *The garum recipes were adapted courtesy of pbs.org. Dried aromatic herbs possessing a strong flavor, such as dill, coriander, fennel, celery, mint, oregano, etc. Make a layer of herbs on the bottom of the container. Add a layer of salt two fingers high on top of the fish. Repeat the layers until the container is filled. Let it rest for seven days in the sun. Mix the sauce daily for 20 days until it becomes a liquid. Bottle or jar your sauce. Cook a quart of grape juice, reducing it to one-tenth its original volume. Dilute two tablespoons of anchovy paste in the concentrated juice and mix in a pinch of oregano. *Recipe is adapted from MattBites. Cook the spaghetti to your liking. While spaghetti is cooking, combine remaining ingredients. Toss the spaghetti in your prepared sauce. Add extra spices and/or colatura as needed. 3. Curtis, Robert I. “In Defense of Garum”, The Classical Journal, Published by The Classical Association of the Middle West and South. pg. 237. This entry was posted in Blog, Bon Appetit Wednesday, Culinary, Culture and tagged ancient history, ancient recipe, Ancient Rome, AntiquityNOW, Bon Appetit Wednesday, colatura, East Asia, fish sauce, garum. Bookmark the permalink. Give Red Boat Fish Sauce a try. It carries the Bon Appetit seal of approval.